Three hundred fifty years ago today Anna Roleffes — nicknamed “Tempel Anneke” — became one of the last* witches executed in Braunschweig, Germany. Roleffes (English Wikipedia page | German) is particularly interesting due to the lengthy and detailed records of her case that remain preserved. 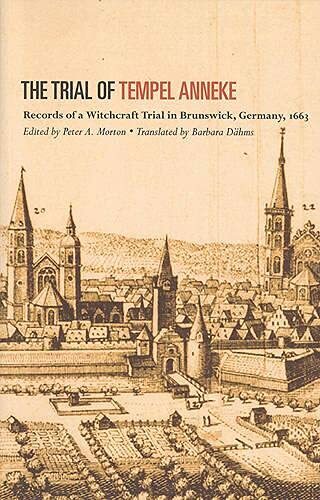 Consequently she’s become the subject of one of the most compelling microhistories of the witch-hunt era, The Trial of Tempel Anneke: Records of a Witchcraft Trial in Brunswick, Germany, 1663. The accused was a widow about 63 years of age, putting her right in the demographic sweet spot for a witchcraft accusation. She lived with her son, and kept up a side business in folk medicine and fortune telling, putting her right in the professional sweet spot for a witchcraft accusation. But again, this was the decline phase of the burning time. The Thirty Years’ War was over,** and with it the time of panicky bloodbaths was receding (ever so gradually) relative to more measured legal procedures. In this meticulously documented instance, procedural rules are rigorously followed by rational, educated investigators looking to convict a duly accused citizen of being the bogeyman.† Some records of the investigation stretch from a full year before her June 1663 arrest. It’s not completely clear exactly how she first entered the judicial process,‡ but her reputed felicity in the augury business stacked up the evidence against her. (Even though some of the witnesses providing it were themselves fined by the court for engaging it in the first place.) One of the first witnesses in the record was a fellow who came to Tempel Anneke for some palmistry. She told him that he’d soon retrieve some pewter silverware that had been stolen from him, and indeed he did. After such an event, you and I might be tempted to leave Tempel Anneke a favorable review on Yelp; Hans Tiehmann, by contrast, reported her for maleficium. A person in such proximity to the many private woes of her neighbors could find such accusations quickly became self-confirming in the juridical eye. One shepherd came to her after losing several sheep. She prescribed a burnt curative and this proved effective in protecting the remainder of his flock. Then he returned complaining of an illness of his own, and this she could not cure. Both transactions inculpate her in the record. Just another satisfied customer! The demonology theory of the day held that any magic at all flowed by definition from Hell. In the hands of judges steeped in such ideas, everyday hexes and cantrips — which, again, many of the witnesses themselves voluntarily sought out — could become, officially, infernal manifestations. From turning up lost cutlery, the proceeding segued all the way demonic contracts. * She was for a time thought to be the last witch executed in Braunschweig. That distinction appears to belong instead to Katharina Sommermeyer (1698). ** Gone, but certainly not forgotten. Tempel Anneke was a widow because her husband died in the Thirty Years’ War. † Modernity can’t cast too many stones here. ‡ The Carolina licensed investigation of someone who was simply “suspected of a crime through common repute.” Many accused witches of course were prior to their formal accusations suspected or reputed witches.